Getting ready for my big night out! When we turned in for bed, Kirk said he wanted to pray a birthday blessing for me. I was willing to receive that, but asked if he would also pray that I would feel the specialness of my day all day today. In years past, it has been hard for me to really embrace the fullness of my birthday when it happens. This might be because I shared the same birth date with a longtime significant other in my life for ten years; birthdays were spent as a shared event, rather than a unique focus on one or the other of us. This wasn't a bad thing, but it did have the effect of keeping me from experiencing the fullness of a special day just for me. And even in the years since then, I've felt disconnected from my day. The residue of long habit, I suppose. This year, I wanted that to be different. I wanted to drink it in, allow myself to receive all the love from those around me, believe that today is special because I am in it, because I was born and my life is a miracle created by God. When the morning came, it crept in slowly. We slept in because Kirk didn't have his morning class, and that felt like luxurious goodness. I dressed for the day in a layered outfit that made me feel girlie and pretty, and tied a spun-gold glass heart necklace around my neck that Kirk had given me for Christmas. It was a cloudy, cool day -- like English weather -- which is just the way I love it and would have it be every day if I could control the skies. And then I proceeeded to freely tell people it was my special day all day long. I had an appointment this morning; I told the lady at the desk and the person I was meeting with that it was my birthday. Instead of hello when I answered the phone, it was, "You're talking to the birthday girl!" And when the waiter at dinner tonight approached the table to introduce himself and ask how we were doing, I told him we were doing great because it was my brithday. He said, "All right!" and knocked fists with me (even though it was a classy joint). All of this was fun. But back to the chronology of the day. After lunch at my favorite Thai restaurant, Kirk dropped me at school. I was running a few minutes late because of lunch and my earlier appointment, and someone from class text messaged me, asking, "Where you at, girl?" Turns out she had baked me a cake, complete with a personalized birthday message on top! They were hoping I hadn't skipped out on class because I wasn't there yet, but I hadn't, so we enjoyed some yummy butter-pecan-cake richness together as a class when I arrived. I felt vervy in class today, hamming it up during a somewhat spontaneous presentation my group had to give about a made-up product we had to create for a pretend product launch. My phone continued to buzzz with birthday calls and text messages, so I felt enfolded in love even as I sat through this afternoon class. But what's really special about today is the secret plans Kirk made to take me out. I had received an e-mail from Kirsten yesterday, asking about our plans for the birthday weekend (since Kirk's birthday is tomorrow, the day after mine, if you can believe it), and I had told her a sketch of what we might do, though nothing had been set in stone yet. When I mentioned this to Kirk yesterday afternoon, to get a feel for how his own thoughts on the weekend had developed, he said matter-of-factly, "Oh, there are plans." Really?! He's quite the secret planner guy, and I felt all amazed and special inside to learn that he had made plans to take me somewhere I'd never been before tonight. It made my day to anticipate the evening outing all day long, without having to know what it was. I love surprises. But before we got to the special plans, we came home from school and took a nap. I pulled on flannel pajama bottoms and a comfy t-shirt and crawled into bed. It was cozy on a cloudy day, and we slept soundly for an hour. We were tired! And then he took me to dinner. Kirk told me the place would be hip, not formal, and he was right. "Z," a restaurant and wine bar in downtown College Park, has dim lighting, red walls, and original artwork hanging everywhere like a gallery show. All of the artwork is for sale, and new artists get shown every two months. Pretty cool revolving decor concept, we thought. At our quiet table by the window, we enjoyed soup and salad, a full-bodied bottle of Merlot that the general manager recommended to us himself, and their famous filet mignon that really is famous for a reason. Yum! Of course, we are dessert people. Kirk got sorbet, but I couldn't resist ordering four chocolate-covered strawberries to enjoy with the rest of my wine. Yum-yum! And of course, great conversation centered around art and faith. Afterward, we stopped by Borders to purchase a CD by the Weepies, another new band we wanted to hear because we now love Deb Talan so much (she's one-half of the Weepies group with her husband), and we drove home listening to our new tunes. Except the night wasn't over. I still had to read my birthday card, and Kirk said there was one more gift. As he set up the front room for the final gift-giving, I went into the bedorom to read the card and proceeded to be moved into a whole other galaxy. Can I just say my hub is so deep and feeling in the way he expresses himself to me? Inside the card, he had written me a poem of sorts. It reads so beautifully and lyrically and contains so many images of how he sees me in the world, and I felt so held and cherished and seen and loved as I let those words wash over me. When Kirk invited me back into the front room, I found he had lit candles and turned the Weepies way up on the player, and that he had settled on the mantle shelf, so subtle that I had to really notice it was there, my gift: the one original print of Kelly Rae's that I've always, always wanted, called "Tell Your Story." When I noticed it sitting there, I squealed so loud and jumped up and down and threw my arms around him before hopping up on a chair to study it more closely. I just stood there and stared, taking in every single word of this gorgeous piece of artwork that this gorgeous woman created. Every single word on this brilliant print is my heart's deepest song, the words I want to remember as I live in the world every day, the words I am learning to live for real and for true right now. 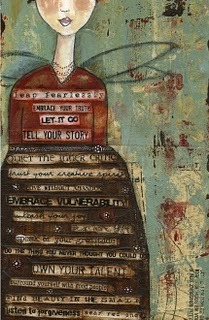 A closer view of "Tell Your Story"
Thank you all for your words of love and birthday well-wishes on my last post. In all, it was such a wonderful day. I feel like I truly embodied the fullness of its specialness in a way I never have before, just like I asked Kirk to pray that I would. Your love was a part of that specialness for me, carried so close to my heart.